If more Americans are hearing good news about the economy, as the Pew Research Center reported Tuesday, it could be because there’s more good news out there to hear. The latest batch of economic data also was published today, showing that there were more job openings — and more people actually hired — in December than in any single month for several years. There were just over 5 million job openings on the last business day of 2014 (after adjusting for seasonal variations), according to the Job Openings and Labor Turnover Survey (known as JOLTS), which is produced by the federal Bureau of Labor Statistics. While that was little changed from November’s level, it was the highest figure since January 2001, just before the dot-com bust. While job openings have been increasing since the latter part of 2009, the pace accelerated markedly last year. Employers hired more than 5.1 million people in December, according to the JOLTS report — again, little changed from November, but the strongest monthly showing since late 2007. Over the full year, hiring increased particularly strongly in the construction and finance/insurance industries — both of which had been hit especially hard by the housing bubble’s collapse. The number of people quitting their jobs also has been rising. Economists generally look at that as a good thing, since people generally don’t quit unless they think they get a better job someplace else. 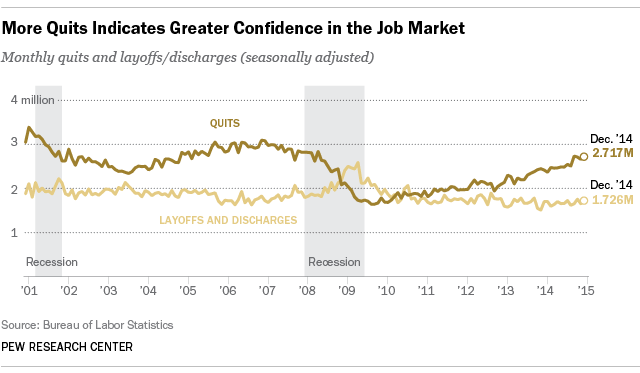 Quits plunged in 2008-2009, as involuntary layoffs and discharges surged. While quit levels have risen since then, they’re still lower than they were before both the Great Recession and the dot-com downturn (when it sometimes seemed as if everyone were leaving to seek start-up gold). The JOLTS data tell much the same story as last week’s employment report, which showed employers adding a seasonally adjusted 257,000 payroll jobs last month and hundreds of thousands of people streaming back into the labor force in search of work. That growing optimism is reflected in the latest Pew Research survey, conducted last week. More people now say they’re hearing mostly good news about the jobs picture (28%) than bad news (22%) – the first time that’s been the case since the Great Recession officially ended in 2009. A year ago, just 12% said they were hearing mostly good jobs news, versus 42% who said they were hearing mostly bad news. And in a separate poll conducted last month, 27% of Americans rated economic conditions as excellent or good, up from 21% in October 2014; over that same timeframe, the share of the public rating economic conditions as poor fell from 33% to 24%.